How-to tips for purchasing the most important products you will need: a baby bed, car seat, stroller and carrier. Your options include a standard crib, miniature crib, bassinet, cradle or bedside co-sleeping bassinet. While a bassinet, cradle or co-sleeping bassinet offers a temporary sleep solution until your baby graduates to a regular crib, a smaller-than-normal portable crib with bars is a versatile short-term option, too. What to Look For: Cribs should be certified by the Juvenile Products Manufacturers Association (JPMA); have a smooth finish; a strong mattress support that adjusts for different heights; and sturdy side bars. Portable cribs should be JPMA certified, have a firm mattress and fold compactly. All babies and children should ride restrained in the back seat of the car. Babies under 2 years of age must ride facing the rear of the car to protect their vulnerable necks and spines from whiplash during a crash. Infant-only seats, for newborns up to 25 pounds, usually come with a separate base that attaches to the car using your car's seat belt or LATCH (Lower Anchors and Tethers for Children) anchors. (Check your vehicle owner's manual to see if your car has the LATCH system.) An alternative is a "convertible" car seat that faces the rear for babies weighing up to 30 pounds and faces forward for toddlers weighing 20-40 pounds or more. What to Look For: A five-point harness system with easy-to-adjust shoulder and waist straps and several slots for adjusting shoulder harnesses as the baby grows; adjustable seat angle; comfortable seat cushioning and headrest for infants; and the ability to safely hold a baby under 2 years old in the rear-facing position. For more information on car seat safety installation, go to www.nhtsa.gov. Lightweight, easy-to-fold models with small wheels are convenient for running errands and racing to airport gates, but sturdy, midsized strollers are the most durable and dependable. Heavyweight strollers with big wheels provide a smoother ride on rough terrain and are best for fitness walking/jogging. 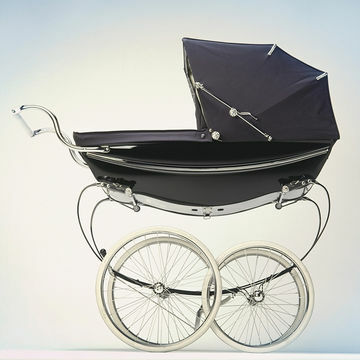 Carriages or "prams" are ideal for city and sidewalk use, but can be heavier and are less compact. Slings and soft front carriers give you the benefit of keeping your baby close (calming for both of you) and having your hands free. Slings allow a young baby to snuggle against you for the first few months. A soft front carrier is perfect for younger and older babies, allowing them to face in or out. What to Look For: For the parent: densely padded shoulder straps. You also may want a model with a waist belt or other type of lumbar support. For the baby: good head support and cushioned leg holes. Sturdy, nonslip buckles for adjusting shoulder and waist straps, as well as strong snaps for adjusting the baby's seat height are important. Should you buy used baby products? While it's fine to buy used toys and clothes, there are a few items you should buy new. "Stay away from anything used that has to do with safety, hygiene and feeding," says Oli Mittermaier, co-founder of The Lila Guide: Baby Gear Buyer's Guide (OAM Solutions, 2005). Prime examples: car seat, crib, mattress and breast pump. To see if products you own have been recalled, go to . For car seat recalls, go to www.nhtsa.dot.gov. - Car Seat You have no way of knowing if a car seat has been in an accident, which can compromise the cushioning foam. Also, safety standards change, and belts, buckles and harnesses wear out. "It's just not a good idea to take a chance on using a car seat that is more than 5 to 7 years old," advises Alan Fields, co-author of Baby Bargains. - Crib In 1999, crib safety standards were revised, but cribs aren't date-stamped. If you don't know when a crib was manufactured, don't buy it. - Breast Pump Potential contamination is the reason to steer clear of previously owned breast pumps. Milk can get into the pumping mechanism; if it's not properly cleaned and sterilized, there is a risk not only of malfunction, but also of transmission of infectious diseases. Since there is no way to guarantee proper cleaning and sterilization, both Fields and Mittermaier recommend buying a new breast pump or renting a hospital-grade pump instead of buying a secondhand one. Hospital-grade pumps are guaranteed against contamination, says Corky Harvey, M.S., R.N., C.L.C., co-owner of The Pump Station in Santa Monica and Hollywood, Calif.
- Go to www.froogle.com and type in the specific name of the item you are looking for, such as "Britax Roundabout." Results are sorted by price, from lowest to highest. - Try to find free shipping or coupon code offers by going to www.google.com and doing a search by vendor plus "coupon code," e.g. "Babystyle coupon code." - Surf parenting message boards for coupon codes, bargains and freebies that other parents have found. The board at www.babybargains.com, for instance, gets 25,000 posts per month. - Scan the free electronic classifieds at www.craigslist.com if you live in one of the areas it covers. It's a great way to get bulkier items, like a dresser or changing table, because you pick up the item locally instead of paying for shipping.